This is our local Tesco in Kingston Park. With 119,000 square feet of retail space, it was once Britain’s biggest hypermarket. Unusually for a modern hypermarket, the retail space is almost exclusively on one level, with only the cafe being upstairs (above non-retail space, rather than as a fashionable and rent-reducing mezzanine). It has a number of concessions inside, including a Johnson’s dry cleaners, a Card Factory, a Co-op Travel Agent, and several more besides. It is really a bit too big, the size rather getting in the way of a pleasant shopping experience. Staff used to zoom around on roller skates, though I haven’t seen them doing that for a little while. That said, I relatively rarely venture in these days. I can’t remember the last time Wendy and I did a big shop there. It’s big, busy, tatty, dirty, unfriendly, and altogether quite unpleasant. 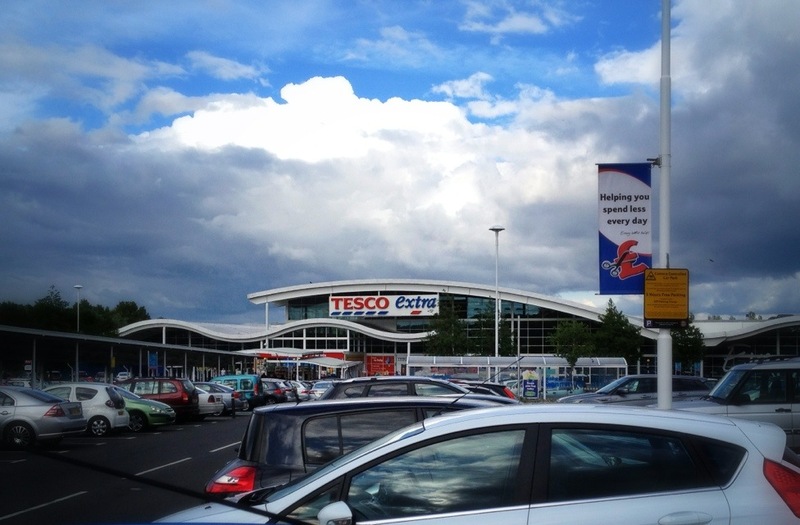 In 2010, Tesco opened a store at Walkden in Salford thats about 50% bigger. I’ve no idea how they fill the space, and I struggle to imagine how the extended pain of pushing a trolley 50% further is met with commensurate benefits… I don’t plan to go and find out! This 1,680th post was filed under: Photo-a-day 2012, Newcastle-upon-Tyne, Retail, Tesco.